With the industry churning out products that are new and improved on an almost daily basis, consumers have found themselves paying a higher and higher price for the most recent innovations. Because the market is so flooded it can be hard to find a product that actually fits your needs, at a reasonable price. Earlier on we had a guide for the Best Bookshelf Speakers Under $500. But even that is a high price for many people who enjoy great sound quality. We’re back again with another guide at a lower price point - $200! And we’re looking to provide our readers with many different options for affordable speakers. Trust us, there are more than enough to choose from – from a set looking as simple as the Fluance SX6, to a more stylish looking model from Q Acoustics. We’ve listed a mix of styles, features, and sound quality to give you an array of options when it comes to budget bookshelf speakers. The Edifier E1700BT is a beginner’s bookshelf speaker, meant for people who need the design and sound of a bookshelf speaker set but not looking for anything out of the ordinary. The inclusion of ‘BT’ in the name lets us know that it’s a Bluetooth capable speaker with the ability to pair with any smartphone or wireless devices. With a mean-looking design, the Edifier R1700BT (see review here) has an angled front that ensures sound is thrown at your ears rather than your chest. Built entirely out of wood, this product features an MDF cabinet and walnut wood vinyl finish. It also features Digital Signal Processing (DSP) and Dynamic Range Control (DRC) to prevent distortion and noise. However we’d still recommend a high quality DAC for completely digital-noise free audio. Inside this 6.6kg speaker set sits a fairly large 4 inch bass driver and a nearly 2 inch silk dome tweeter that produces a frequency range between 60-20000 hz at an impedance of just 4 Ohms. With a total sound output of 66w, the Edifier R1700BT is one of the loudest speakers on our list and is more than enough for a large room. There aren’t many options available as far as connectivity, however you do get what’s necessary: a PC optical input and an aux in as well as the Bluetooth option. There’s a small remote control included as well for volume control, mute/unmute, Bluetooth connect, and switching between input sources. Three knobs on the right speaker control treble, bass and volume. Mackie’s bookshelf speakers are targeted toward a young audience want a sense of style and freshness in their audio equipment. A direct competition to the ‘budget-friendly’ M-Audio AV42, the design of Mackie CR4 it both gorgeous and subtle compared to the AV42. Since these are deemed reference-grade studio monitors, users get a fairly accurate and loud sound (50W output). They’ll be a great addition to any music studio or home. There’s also a Bluetooth version of this speaker available for $50 more if you want to increase your connectivity options and a CR4 Limited Edition available at same price as that of the CR4. Dimension wise, the Mackie CR4s are 8.2 inches high, 5.5 inches wide, and 6.2 inches deep. 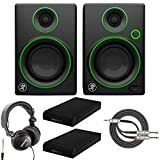 Aside from the speakers this package also includes a couple of isolation pads that can be kept underneath the speakers to reduce vibrations and noise. The right speaker is particularly heavy due to it being active-powered compared to the left speaker, which is passive. Some customers on close-listening found the left speaker had marginally less volume than the right speaker. However this isn’t a deal-breaker for everyday use, and is really only noticeable when listening at low volume. The green accents around the 4-inch bass driver and silk dome tweeter make this recognizable as a Mackie-branded speaker. The headphone jack can be connected to the Mackie CR4 via the aux port at the bottom right corner of the right speaker. Despite not having an ideal design for a bookshelf speaker, the Edifier e25 Luna Eclipse is unquestionably stylish. If you’re looking for the best home theater speakers under $200, these should definitely be on your list. They’re attention-grabbing and will give guests something to talk about at parties and get togethers. Available in black, red and white, the Edifier e25 has a futuristic design fit seamlessly into any modern home. With an egg-shaped angled design, the e25 houses a 3-inch bass driver at the front and 2 and 3 inch passive bass radiators at the back in a single speaker unit. There’s also enough room for a 2 inch silk dome tweeter. With multiple drivers in a single speaker, customers are bound to get loud output at 74W.Despite the impressive innards this speaker set isn’t large at all with a HxWxD measurement of 9 x 9 x 5 inches. They can easily fit next to a desktop monitor or under a television. 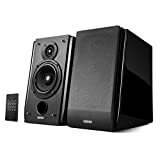 You can also couple these with Edifier’s Speaker Stand and place them on either side of your TV for an encompassing sound. A great addition is the included wireless remote, which is very sleek and stylish. It has a completely minimalistic look with only power on/off and volume up/down buttons. Without the remote volume and power can be controlled via the touch buttons on the speaker set. The e25 Luna Eclipse comes with Bluetooth connectivity, giving users the ability to connect to smartphone, tablet, and computers wirelessly. Looking for home speakers that cater to all your multimedia needs and comes in the bookshelf style? You need not look further than the Edifier R1850DB. These are some of the best Bluetooth bookshelf speakers on our list and the third speaker from Edifier brand that we’re happy to present. Compared to the other speakers from the same brand, the R1850DB is quite an upgrade. It comes with a built-in amplifier and option for a sub line-out that allows you to add a subwoofer to this already high-end sounding speaker. The 1850DB is only available in black with a piano finish. Out of the box it does looks fantastic but is a fingerprint magnet. Be prepared to wipe this device down frequently due to easy smudging. Other than Bluetooth, it comes with a slew of connectivity options that are hard to find in other systems under $200. The back of the speaker features a treble and bass knob, RCA input, RCA to aux input, optical input port, coaxial input port, sub out port, left speaker out port, power button, and a volume knob that also acts as input selection as well. This definitely makes it the best home stereo for the money. The only disadvantage is that all the ports and knobs are located at the back of the speaker and can be rather intimidating. The Edifier 1850DB isn’t as appealing in designed compared to other bookshelf speakers on our list. It looks quite similar to the 1700BT. But when it comes to sound output, the Edifier 1850DB offers 70W of power with a wide range of sound. It’s a great set up for near-field listening. The speaker stands at 10 inches high and 8.8 inches deep. You can also add a subwoofer speaker to your system for that little extra oomph of low frequency kick-in. Flaunce is an audio brand that produces budget bookshelf speakers that are intensely charming to look at. The recently launched Flaunce Ai40 is no exception. It is available in three colors: black ash, lucky bamboo, and natural walnut. The Flaunce includes Bluetooth for wireless pairing with AptX Technology for compression free data transfer. Dimension wise, the Ai40s are relatively large at 11 inches in height but only 7.6 inches deep. It consists of a 5-inch bass unit and a 1-inch tweeter unit that collectively put out a total sound output of 70W, which is substantial enough to fill an entire room. Since it’s a powered speaker unit containing a built-in Class D amplifier, you don’t need an external amp or cables to get started. These are basically plug-and-play out of the box. The package also comes with a small remote control that hosts quite a few control settings. Using the remote, you can adjust treble and bass, select between multiple sources, change the volume up/down, play/pause, change tracks, and more. When it comes to quality the bass response goes low but never overpowers the other two frequencies. It feels very tight - even the trebles don’t sound crass at high volume. Love the old school way of listening music? Then the Flaunce Ai40 are definitely the best bookshelf speakers for vinyl music listening. The back side of the powered speaker features DC power input, connection for the left speaker, RCA input, and Bluetooth pairing. Moreover, the package includes an 18 gauge speaker cable, power brick and cable, RCA cable, and remote control. 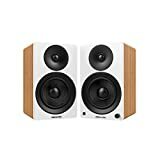 Looking for a small sized bookshelf speaker that delivers a massive sound and is completely American? Check out the Polk Audio S15. The Polk Audio S15 has the design of a basic bookshelf speaker. The glossy part at the front of each speaker unit that surrounds the woofer unit gives it a unique look and makes them easily identifiable. It is a two-way speaker that features a 1 inch terylene tweeter to produce higher frequencies effectively. On the other hand, a 5.25 inch mica-reinforced polypropylene woofer unit creates clear bass and a dynamic midrange. USP of this speaker is the ‘power port’ at the back of each unit. This is exclusive to Polk and offers excellent and profound bass response while minimizing turbulence and distortion. What it does is spread out the lower frequencies evenly around a wide area. The height of each speaker unit stands at 12-inches, whereas the depth is just over 10-inches. Though being such a small stereo speaker set, they are capable of producing a frequency response from 50Hz all the way up to 40kHz. Still, I do want to mention that these speakers are passive and will need an amplifier to power them. This mini bookshelf speaker has a height of 9.25 inches and depth of eight inches, putting them on the smaller product side. They sit comfortably on either side of a computer monitor, TV, or amplifier. Though this speaker isn’t a plug-and-play type, the rounded edges give it a user-friendly feel. These are passive speakers and you’ll need an external amplifier like the Lepai LP-2020TI and 16 gauge speaker wires that cost just under $10 to get started. To make your setup even more interesting, consider adding a DAC like the Fiio E10K or Fiio BTR1 for a wireless option. The Q Acoustics 3010 comes with a 4 inch woofer unit and a 1 inch tweeter unit to complete the setup. The bass unit is made up of aramid fibers and paper cones, whereas the tweeter (treble) unit is made up of 2-in-1 concentric advanced ring-dome tweeters, which offer an audiophile-grade sound output. The sound quality is much better than its competitors, however keep in mind that you’ll need a good setup to drive them to their full potential. The Q Acoustics 3010s offer a sweet bass and sound that doesn’t distort at high volume. Due to their size and design, they sound good no matter where you place them around the house. The Elac Debut B4 is the newest member in the Debut Series. With other models from this company receiving rave reviews, it’s obvious why the Elac Debut B4 made it onto our list of best bookshelf speakers under $200. Unlike its big brother the B6, the B4 features a 4 inch bass driver, which produces a wide range of frequencies and is a great fit for people looking to get into professional and critical sound listening. Before we go any further, let us first mention that the Elac Debut B4 has the best build quality we’ve seen and felt on any bookshelf speakers, and for the price it’s sitting at it’s a steal. The vinyl wrap gives it an expensive look and makes it a style statement in any home. Without the grille the precisely designed bass driver and tweeter combination is visible. Now that we’ve drooled over its premium design, let take a look at performance. 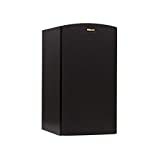 This product is fairly similar to B6, however since it has a smaller cabinet there’s a slightly recessed bass. If you were drawn to the B6 but it isn’t in your budget, there’s the Elac Debut B5 available with a bigger cabinet compared to B4 along with a 5.25-inch bass driver. Putting more than one product from this line might be cheating, but we’re impressed with all three of them and believe they’re bound to meet the needs of most of our readers. The Klipsch R-15M is the only speaker on our list featuring a 5.25 inch bass driver that has the ability to produce a wide frequency response between 64-24000Hz. Compared to other speakers on our list, the Klipsch R-15M has a very unique and retro design. It’s easily recognized as a speaker from Klipsch due to its copper-colored bass driver and rectangular shape around the tweeter. The bass driver is coupled with a fairly large 1 inch tweeter built using aluminum and features Klipsch’s very own 90x90 Tractrix horn technology. Get power and versatility in a small package, the Klipsch R-15M bookshelf speakers pack a mean punch. These speakers perform beautifully as a left,center,right, or surround. Klipsch Reference Bookshelf speakers feature a rear-firing port that is perfectly match to the cabinet and drivers. The speaker generates a total sound output of 85W, which is more than enough to fill a 500 sq. ft. room at half volume. Built using an MDF wooden cabinet, the manufacturer has managed to keep the overall weight down to just 4.67 kgs with a height of 12.5 inches, width of 7 inches, and depth of almost 8 inches. Getting the Klipsch R-15M started is fairly simple: just connect the left speaker to the right with the provided cable, add an input source (digital or analogue), power it on and you’re ready to go. Considering its size, we’d recommend using the R-15M as a replacement to your TV speakers rather than connecting them to your computer as the stereo separation won’t be noticeable while you’re sitting close to it. If you do decide to use these as television speakers, a Heavy Duty Speaker Stand is recommended. 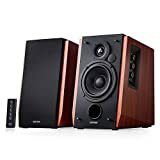 The speaker itself is great for listening to all kinds of music but if you want to add some bass it can be coupled with a simple subwoofer from Polk. I hope you enjoyed reading the article and it helped you choosing the Best Bookshelf speaker for you under $200. It’s amazing to know that there are so many options to choose from, and selecting only top 9 speakers out of them was a difficult task on its own. However if you did liked the article, please consider sharing it on social media with your friends, who might be looking for same.